Rapport means speaking to people on their level and using their language to convince them of ideas they would not have understood had they been presented in another form. Rapport is the ability to enter the world of others and to build a bridge to them. It is the art of getting the support and collaboration of others in order to achieve a common goal. Rapport is a relationship marked by agreement, same direction or similarity. If there is rapport, resistance will disappear. Rapport means establishing a deep contact to the unconscious of the other person. We say things like: "We were on the same wavelength." "There was a mutual understanding between us." or "We like each other." Rapport is very important in terms of trust. A doctor needs the trust of his patients. A sales person needs the trust of his customers. A mother needs the trust of a child. Many issues in our daily interactions are about trust. 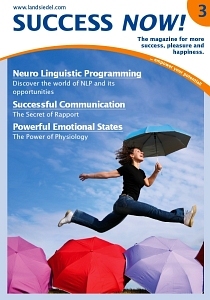 NLP examines carefully how this trust is established and what we can contribute to make it deeper and more intense. People like people who are like themselves. Once we have found common ground in a conversation, the dialogue flows naturally. NLP has discovered that this similarity does not only concern the of conversation topics but body language too. People who like each other and have a deep contact unconsciously adjust their behaviour to one another. This phenomenon can also be used the other way round: By adjusting your behaviour you deepen the rapport to the other person. This is called mirroring in NLP. Mirroring means adapting one's body in terms of posture, gestures, breathing, facial expressions, movement or weight shift, muscle tensions, etc. We respond like a mirror to everything we can see. Pacing means matching one's entire range of visual and auditory expression to the other person. The other person is picked up where they stand. I like pacing speech rate, rhythm and tone of others, for instance. This category also includes everything entailed in mirroring. One special form of mirroring is known as "crossover mirroring". In this case, one feature of the other person is mirrored by another feature, e.g. breath by movements of the fingers, crossed arms by crossed legs, rhythms of speech by movements of the head, etc. Having matched the other person for a while and established rapport, we can start to lead and change the direction of the communication. Leading means to lead someone to a certain goal or result on the basis of rapport and in terms of the win-win principle. Leading also provide an opportunity for checking whether a trusting relationship has been established. If it has, the other person will unconsciously follow my leading after a short time. If that doesn't happen, I need to go back to matching. This method enables me to lead someone from a bad emotional state into a better state, for example. When all three channels fit together we also say we are congruent. If the messages don't fit, we call this incongruence. In this case, we rely first of all on body language, then on the voice and lastly the spoken word - doubtless because we have often had the experience of being lied to. This is why some researchers into body language say: "The body never lies." In a famous study, Albert Mehrabian (The Journal of Counselling Psychology 31, p. 248-252, 1967) found that body language accounted for 55% of the effect when making a presentation before a group. This meant 55% of the power of persuasion rested on posture, gestures, facial expressions, eye contact and other factors of body language. 38% of the effect was achieved by voice modulation and other vocal characteristics. Only 7% was down to the content of the presentation. Some interesting conclusions can be drawn from this: We have the most influence when we present convincing messages through all three channels. Body language and voice are often greatly underestimated.